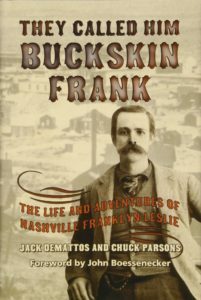 They Called Him Buckskin Frank, Jack Demattos an Chuck Parsons, University of North Texas Press, $29.95, Cloth, Photos, Notes, Bibliography, Index. The name Buckskin Frank Leslie seems always to appear in the old Tombstone stories. Doc Holliday the Earps, Johnny Ringo and some others had some association with him, but he was always on the “fringe.” (No pun intended.) He was tagged with the name “Buckskin Frank” probably because he nearly always wore a buckskin jacket. The reality was that he handled guns, sometimes rode with the sheriff, scouted for the Army during the Geronimo campaign, and owned saloons in Tombstone. He was notorious for having shot and killed his girlfriend but never really became a major figure in the Tombstone story we have seen in countless movies and television shows. The authors of this book have sorted through the wild tales and incomplete history of Buckskin Frank, but information such as exactly where he was born, and parental history remain vague. He claimed to be college educated, and this may very well be true. A long letter he wrote for a San Francisco newspaper in 1900 detailing his participation in trailing Apaches is extremely well-written. This alone shows he was probably educated beyond the usual Tombstone cowboys of that time. Buckskin Frank was short in statue, but handsome nonetheless, able to attract the ladies in droves. He had a long list of girlfriends, lovers and wives. He shot and killed the husband of one of his future wives, he left others in divorce court or simply vanished when convenient. One lady scheduled to be his wife was left quite dead as a result of the business end of his shootin’ iron after a drunken brawl at his ranch near Tombstone. Her grave marker in the Arizona desert says “Mollie Williams”, but her real name was Mollie Edwards. The result of her death sent Buckskin Frank to Yuma Territorial prison for eight years. He was a model prisoner, put in charge of the prison pharmacy, and was released early due to his good behavior on November 17, 1896. He was met at the prison gates by a love-sick widow whom he married fifteen days later. After promising her a honeymoon trip to China, he dumped her in April. Apparently China was the farthest thing from his mind. He spun some good yarns about himself, which got mixed up with reality thus making it difficult for biographers to sift through the information, real and otherwise. For instance he claimed to have been a scout for General George Armstrong Custer, but no military records can be found giving proof of this. He did scout during the Geronimo Campaign in Arizona, having gone deep into Mexico hunting for runaway Apaches. He did kill several men in gunfights, and he was involved in the Spanish American War in Cuba. The authors have trailed Buckskin Frank to San Francisco where he continued to move from one house to another, frequented billiard parlors and saloons, had mining interests South of the Border, and eventually in his old age disappeared all together. It is suggested he was the victim of foul play, complete with skeletal remains, outside Oakland, California. Who really was Buckskin Frank Leslie? This book is a fascinating read.